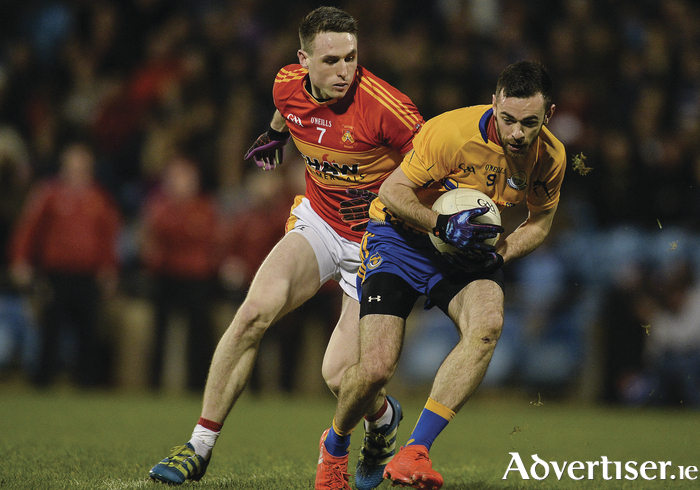 The clash of Kevin McLoughlin (Knockmore) and Paddy Durcan (Castlebar Mitchels) will be one of the highlights of this weekend's round of games in the Mayo GAA Senior Football League. Photo: Sportsfile. The meeting of Castlebar Mitchels and Knockmore in north Mayo on Saturday evening tops the billing in round two of the Mayo GAA Senior Football League this weekend. The sides met in last year's senior county final with the Mitchels running out winners that day against the north Mayo men. Last weekend Castlebar opened their league account for the season with a comfortable 0-21 to 0-10 win over Hollymount-Carramore in Munnelly Park, with Neil Douglas showing that he is still one of the classiest forwards in the county finishing off his day with 0-9 to his name, just one shy of the total scored by the south Mayo men. Knockmore also got off to a winning start seeing off Ballaghaderreen on the road by five points on a scoreline of 1-13 to 1-8. Peter Naughton was the main man for Knockmore hitting 1-6 over the 60 minutes, with his goal midway through the second half the decisive score in the contest. Two other sides which also picked up opening day wins will also meet on Saturday evening, when Claremorris, fresh from their 3-11 to 4-7 win over Aghamore on the road will host a Breaffy side who eased their way through the gears to see off Garrymore at home by 11 points. Claremorris' Conor Diskin will be a man Breaffy will be looking to keep an eye on after the full forward kicked 2-2 last weekend, with James Shaughnessy also chipping in with five points in that win. Breaffy for their part were impressive after a slow start against Garrymore, with Liam Irwin kicking six points and Seamus O'Shea looking at home in an unfamiliar centre-half-back position. Garrymore will host Ballagahderreen this weekend, they will be hoping that the injury picked up by Shane Nally midway through the first half of their loss last weekend is not serious as they will need his leadership as they look to get back to winning ways this weekend. Ballagh also will be hoping to get a win in their column this weekend after their five point loss to Knockmore last time out, Barry Regan hit five points with Andy Moran chipping in with three of his own and Peter Kelly finding the net in that game, but they will need more than three men hitting the target if they are to get a win - you would expect. It is an all south Mayo clash in Hollymount, when Davitts come calling on Saturday evening, the hosts were well beaten by Castlebar Mitchels last time out, while Crossmolina Deel Rovers saw off Davitts by five points in their league opener. Liam Kearns hit six points for Davitts in that one, but it was not enough — while for Hollymount-Carramore Darren Coen was the leading marksman kicking four of his side's 10 points against Castlebar. The impressive Crossmolina Deel Rovers will face a tough challenge on Saturday evening if they are to make it two from two when they host Ballintubber. Brian Benson and Fionan Duffy led the charge on the scoreboard in their win over Davitts, kicking 1-1 and 0-4 respectively, but more impressively six other players also registered scores in that win. Ballintubber's game against Charlestown did not go ahead, but having won the Michael Walsh league the west Mayo men are coming into this game in good form. It is an all east Mayo clash in the final game in division 1A this weekend when Charlestown travel to Aghamore, as was mentioned previously Charlestown's game last weekend was postponed following a death in the community. Aghamore were for their part involved in a high scoring encounter against Claremorris, but they came out on the wrong side of a 3-11 to 4-7 result. Alan Freeman did put in one of the most impressive performances of the opening weekend, bagging 3-2 for himself, these games are usually tough encounters and we will expect no different this time around.